Shawn Padilla uses his smart phone to resrve a Zipcar. Concerned about the high cost of keeping and maintaining his car, Santa Cruzan Shawn Padilla wondered if he could get along without a car. Then he discovered the Zipcar program. Zipcar is a car sharing program that gives you wheels when you want them without having to deal with the expense and exasperation of owning a car. No waiting for oil changes, no car payments, no shopping for tires or trying to find a mechanic you trust. Zipcar takes care of all that and more. Here’s how it works. After joining online, members receive a card which gives them access to Zipcars located in downtown Santa Cruz, on the UCSC campus, or in other cities or universities throughout the US, the UK and Canada. Cars can be reserved online by the hour and by the day at any time of day or night. The hourly or daily rate includes gas, insurance, maintenance and 180 miles/day. When Padilla needs a car, he reserves one using his smart phone, walks to where the car is parked, swipes his membership card and drives away. 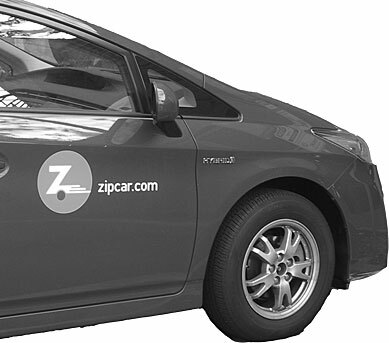 In Santa Cruz the Zipcar fleet consists of sedans, hatchbacks and hybrids. There are currently 15 vehicles in the program, 9 on campus and 6 located in the downtown area. For Padilla who lives a mile and a half from work, joining Zipcar meant biking to work instead of driving. It also meant saving lots of money—$300–$500/month. “Do the math,” urges Padilla, who knows about such things as the Chief Operating Officer of the Santa Cruz Community Credit Union. “I was making a car payment, buying a parking permit, spending money on maintenance, gas, insurance, registration. I did a detailed analysis.” Padilla sold his car after joining the program. 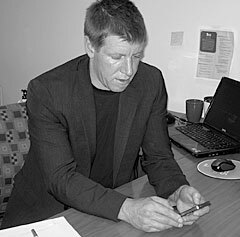 Since he works in downtown Santa Cruz, Zipcar locations are within a short walk. Late charges for not returning a car on time greatly reduce the probability a car will not be there as promised. An unexpected benefit of joining the program according to Padilla is that it precipitated a change in his habits. “I’m more mindful of the environment,” Padilla admitted. “Grocery shopping requires advanced planning, and I remember to bring my bags.” Studies show that Zipcar members drive about 40% fewer miles than when they owned a car. Padilla loves the efficiency of sharing Zipcars. He likes it so much, he encouraged the Credit Union to purchase a business membership. Locally, Zipcar is partnering with the City and County of Santa Cruz, UCSC, and Ecology Action to increase awareness and use of the program. The recent expansion of the program in Santa Cruz is partially funded by a grant from the Monterey Bay Unified Air Pollution Control District. For more information visit www.zipcar.com/santacruz.